My name is Peter and I own Spitting Pig Sussex. 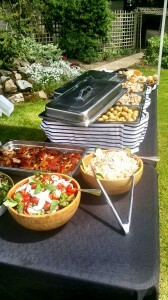 I have spent many years as a chef catering at all types of events in and around Sussex. My passion and commitment to good food has only grown stronger through the success from Spitting Pig Sussex and the experiences with our wonderful clients. On the back of our enthusiasm for hog roasting we’ve occupied the realms of excellence since I started the company, and we have no intentions to give up our position any time soon. My company has many services that we can offer to you, all of which are reputed as being the best to be had in Sussex, and with good reason. We outright refuse anything that falls short of excellence, from the food, machines and the staff we employ, all of which are a reflection of my values and standards. 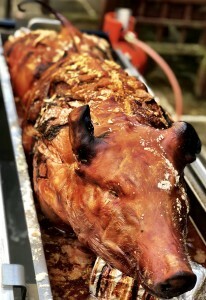 It was at a friend’s party when I first got a sample of a Gatwick hog roast, with my previous experience in the catering industry I knew immediately that there was something to hog roasting, from the perspective of both business and pleasure. My time served experience running successful catering companies put me in a great position to exploit what’s turned out to be a massive demand in the market, and I embraced the opportunity with open arms. I started the company with 2 prime goals, to provide Haywards Heath hog roast catering and also a Chichester hog roast hire service. 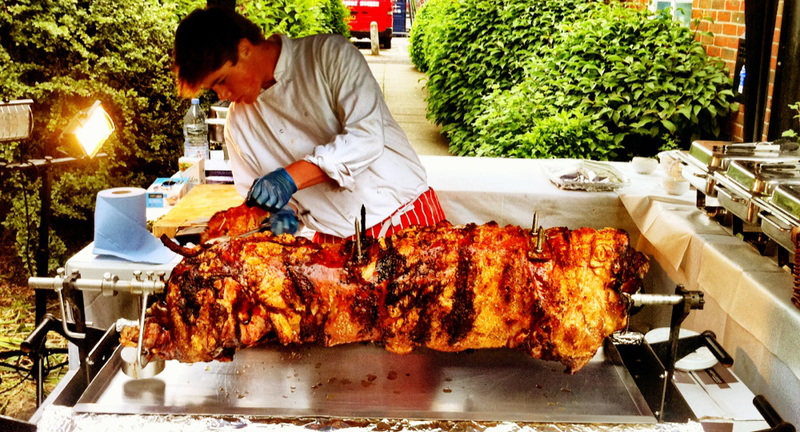 We were soon forced to re assess the extent of what we did after a rise in demand from previous clients, now we provide not just spit roast catering and hire, but also sell our machines. There are individual benefits to all three. The catering service is favoured by clients looking to cater with style and grandeur for, usually, a one off occasion; the machines hire service tends very popular with clients who would like to cook with our machines themselves, while keeping the costs a little lower; clients buying our machines often – but certainly not always – fall into 2 brackets, either caterers like ourselves who want ‘in’ on the market, so to speak, and previous clients who’ve been witness to the brilliance of hog roasting and want a machine for their own backyard BBQs and family get-togethers. Regardless of your reasons or preference, one thing that’s constant is the quality and delights provided by hog roasting. Whether it’s you or our chefs manning the machines, the mouth watering qualities of hog roasted meats is unchanging. The beauty of spit roast machines is in their simplicity and ease of use, you don’t have to be a rocket surgeon to cook up amazing, taste bud tingling spit roasted meats – And although health and safety would have something to say about it, a 5 year old (a tall one, at least) child could theoretically operate a machine. What you’re basically getting is the crock pot of the BBQ world, there’s very little hands-on work required. Simply buy your meats, marinade or season them with your favourite herbs and spices, skewer the meats, turn your machine on and wait. Watching your food cooking can be an agonising wait at the best of times, but the sight of a whole hog, lamb or chickens spinning round and round, cm by cm, will certainly whet an appetite and give your friends a topic of conversation. With a hog roast machine you might even convince your kids to leave the house! 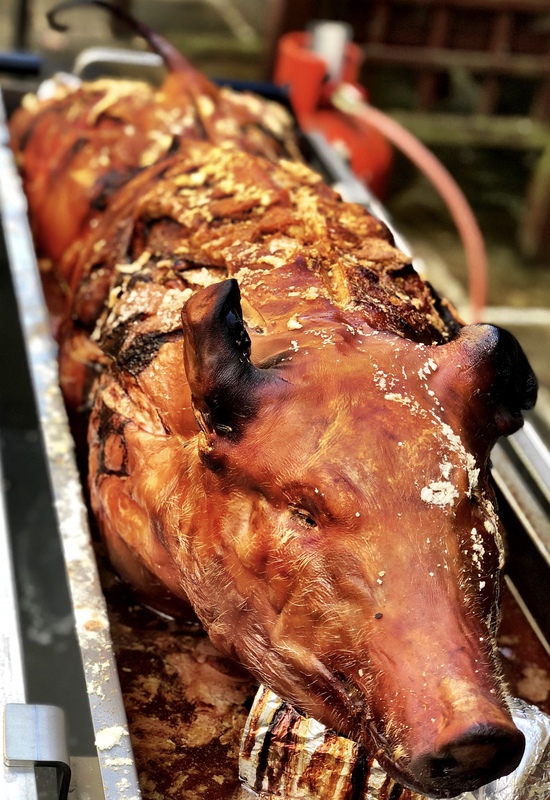 We were helped by some of the UK’s leading chefs and food critic to create and master our menus which has led to the Hog Roast Sussex catering service being nominated for and winning culinary awards on several occasions since we started operating. We go beyond simply cooking up amazing food, our service and friendly approach to clients and customers is just as much a staple of my company as the food itself. From the first conversation you have with us you’ll soon realise that we care about our customers and your peace of mind and needs just as much as hog roasting. We’ll help and assist you throughout, because I don’t believe good service starts and ends with the quality of food and hog roast machines. This approach is the reason I’ve had such great success with the Hog Roast Sussex catering service and would be honoured to help you in any way, no matter what the occasion or scale. 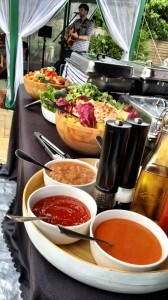 With my large family of chefs and waitresses we’re able to cater for different clients in several locations a day, on most days of the year. And while we’re certainly not short of clients we’re always looking to work with and meet new people and businesses. Spitting Pig Sussex was founded in 2006 as a partnership between myself, Robert Taylor and my oldest friend Michael Hamer however the roots of Spitting Pig and our experience in the industry goes back a little further than that. Growing up together Michael and I always had ambitions to run our own pub and restaurant. After leaving high school many many years ago now we both set about becoming chefs and undertook the relevant qualifications whilst working in kitchens in our home town of Littlehampton in West Sussex. The years past and as they did our experience and confidence grew, it wasn’t before long that I became head chef of the Lamb and Flag a small and beautiful country pub in West Sussex that was building a fierce reputation for its traditional home cooking and already had several accolades to it name. I loved working in the Lamb and Flag I had complete control of the menus and was allow to experiment in the kitchen, however my favourite day of the week was Sunday it was what the pub was famous for its traditional Sunday roasts with all the trimmings and it was a dish i was immensely proud of. A few years later the original owners of the Lamb and Flag who I am eternally indebted too planned to emigrate to Australia to be closer to family. Therefore they were planned to sell the pub that they had saved from the brink of collapse, they wanted someone they could trust, and someone who they knew would continue to uphold its reputation on welcoming atmosphere. I was of course completely astonished when they said they wanted me to take over the pub I didn’t know what to think. However after careful consideration and countless meeting with my bank manager I became an owner of the Lamb and Flag and finally I had realised my dream. However I was not alone in this venture Michael had agreed to join me on my journey beginning far superior in all the business aspects of running a pub and restaurant is guidance was invaluable in the early years of our partnership furthermore is vast culinary experience made him one of the best chefs in the county. Once of the first changes we made was to upgrade the kitchen and while searching for some exciting new appliances like excited school children we came across the Spitting Pig Company. After just a couple of conversations with Stephen and the team at head office he had shown us all the possibilities of outdoor catering and the wonderful world of hog roasts. After a very successful summer working with Hog Roasting equipment hosting barbeque’s and parties at our pub we were convinced that this could be an extremely profitable side arm to our business. In the spring of 2006 Spitting Pig Sussex was born and we began operating under the Spitting Pig brand using our pub as our base. Four years later and we haven’t looked back both our company and our experience has grown year upon year and we continue to be our traditional recipes to the outdoor catering market.